Postures, Techniques, Teaching Methodology, Yoga Anatomy & Physiology, Pranayama/Breath Work, Philosophy, Meditation, Specialty - Yoga with Weights. Teacher Certification Program and Advancing Studies Programs are now in progress. If you would like information on joining this ongoing training or for future training with Sherri Baptiste of Baptiste Power of Yoga™ or Yoga with Weights Training please call 1-888-804-YOGA	or send an email to info@powerofyoga.com. We welcome your questions and interest for this and future programs. The very first Baptiste Inspired Yoga Teacher Certification Training Program was offered in La Jolla California in 1998. Since then it has been my pleasure to organize several other Baptiste Inspired teacher training’s based out of Marin County California that have cultivated the professional evolution of some exceptional, excellent, and successful teachers now enriching many of the yoga programs being offered in our communities. They have gone on to create successful classes and programs of their own around the country. Many have gone forward to teach group and private clients, lead retreats, presenting workshops in health, fitness clubs and yoga studios. Some have integrated these yoga techniques into their personal training in gyms and fitness facilities. Others have taught in the schools, developed meditation programs in their community, offered their own teachers training programs and are serving as faculty at the conference level as well. It’s exciting for us all to see potential realized. I’ve been told by those who study with some of the teachers inspired and teachers certified through these Baptiste Power of Yoga, LLC ‘Yoga Alliance registered’ Programs that these: Baptiste inspired ‘Certified Yoga Teachers’ are completely different from one another, unique and authentic in who they are and how they express themselves as teachers, and yet they have one thing in common...and that is that they are EXCELLENT! Requests have been steady in the last year for more training, so much so that I’m drawn towards mentoring in those interested through and into their training and certifications. To meet the needs and desires of both local students, and other requests from around the country for a: Teacher Training, ‘Yoga Teacher Certification’ and Advancing Studies Program, I’ve taken a hard look at the best way to provide this, and how best to optimize our time together this year. To maximize our time, and commitment in this area, and to give participants the proper credits and training necessary to qualify for Certification as a ‘Yoga Teacher’, I see a window of opportunity in this next year to support, and mentor those truly interested in this training with retreats, classes and workshops. Training’s will be with myself, and a special selection of Expert and Master Teachers, to balance the participant’s experience, and integrity of study over the next year. There are Classes, Workshops, Conference, Retreats, Yoga Therapy Conferences that will help you to fulfill necessary elements, and continued inspiration, study, understanding and growth in the Baptiste Power of Yoga™ Training/Advancing Studies Program. 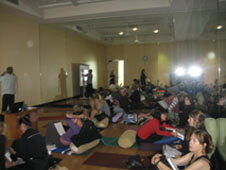 Registrations flow in for these retreats, trips, workshops, etc, consistently to capacity and our space is limited. I encourage you to always reserve your space and book your air early for best rates when registering. Take your training with us seriously and secure your space as these events are typically offered to the larger student body as well and not only the teachers training groups. Our process of training tends to be exciting and in-depth, personally transformative in the process with beautiful retreats for the body that inspire mind and heart as well. Training together is built on the foundation of personal practice. Your personal practice opens you towards deeper realizations of a greater perspective that yoga and life has to offer you. The approach in this program is for practical training with real life understanding of what it is to teach. The Baptiste Method of Yoga™ also offers optimal and excellent training for your own personal practice, or for you as a teacher wishing to grow and deepen in what is brought forth to the students you work with. The practice, and teaching of yoga is personally fulfilling...but to become a real teacher calls for a strong commitment to practice, study and continual life long personal development. Baptiste Power of Yoga, LLC Training’s offer a unique opportunity to enhance, refresh, motivate, and inspire not only the practitioner on every level, but serve to enhance the ability as a teacher to serve the student well with skillful understanding and to contribute to the greater good of the community with personal truth and integrity in the process. For those interested in the mentoring program you’ll deepen your foundation and understanding in the basic skills, learning to teach a safe and effective class to your students. You’ll also find that the training will offer some sessions with special emphasis on the healing qualities and therapeutics of yoga...This type of instructional knowledge is so valuable in the longevity of being a teacher, and what you have to offer others. Please contact and join us if interested...it’s a very special invitation that I’m extending to you. The process of training and advancing studies for the participants will be personally enriching and rewarding in everyway. Please contact us immediately if you are interested in participating in this special invitation. 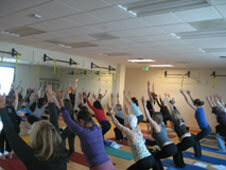 Baptiste Yoga Teacher Certification and Continued Ed Programs. Invite Sherri Baptiste, E-RYT 500, to be a part of your teachers training faculty. Learn more about what she has to offer, email info@powerofyoga.com or phone 888-804-9642.